During the holy month of Ramzan, many areas in Bangalore turn into a non-vegetarian food lover’s delight in the evenings. Catering to the people breaking their fasts after the Iftar prayers, a large number of temporary stalls come up, especially near the Masjids. Apart from Mosque Road and Shivajinagar, a large number of stalls also come up near Masjid-E-Eidgah Bilal on Bannerghatta Road, and the Tilaknagar Mosque close by. It was the first week of Ramzan, and four of us landed up near Masjid E Bilal on Bannerghatta Road around 6 pm. 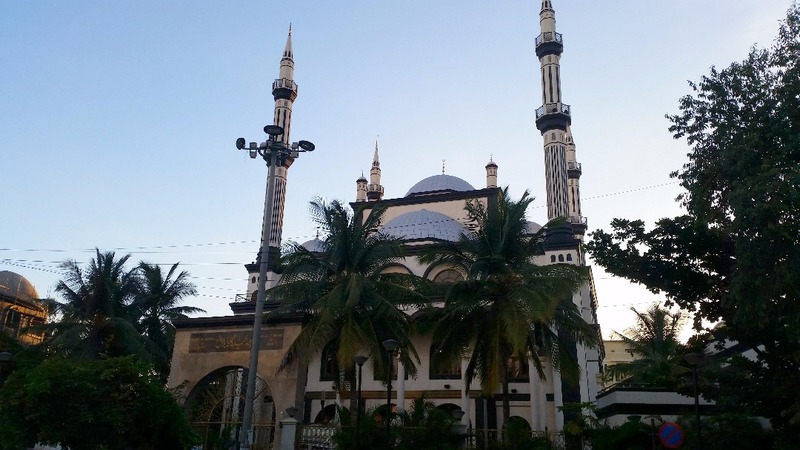 The mosque is about a kilometre south of Dairy Circle and the evening prayers had just got over. The lane opposite the mosque was abuzz with stalls selling a variety of food, such as fruits, sweets, samosas and haleem. Our first stop was Madeena Hotel. On offer were a variety of samosas – onion, beef and magaz (brain). We decided to try one of each variety, costing Rs 15 each. The samosas were crispy with a spicy and tasty filling. However, the magaz samosa seemed to have very little bheja (brain) and a lot of onions. Across the road, a stall named HMV was advertising Hyderabad style Haleem. Being from Hyderabad, I could not help but try this version out. 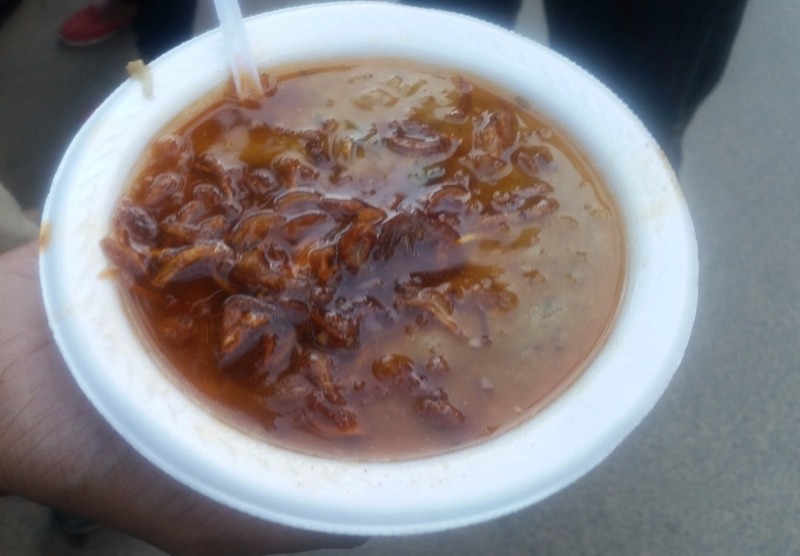 The haleem here was much more liquid, almost like a gravy. The spice quotient was high and the taste was not bad. But, it was definitely not anything like the ones served in Hyderabad. After a short tea break, we set out for Tilaknagar Main Road. We were advised that there were many stalls selling good quality chicken, lamb and beef dishes. I had read that after a ban on street food stalls during Iftar near Mosque Road, many stalls have shifted to this locality. As you proceed towards the Tilaknagar mosque from the Sagar Hospital end, the first stall you come across is SK Basha’s Ramzan Food Stall. They specialize in Kadi Kababs, where marinated pieces of chicken are covered with egg batter and fried. The place had two special marinades – a green, and a red apart from the normal kadis. The kabab is served on a stick. 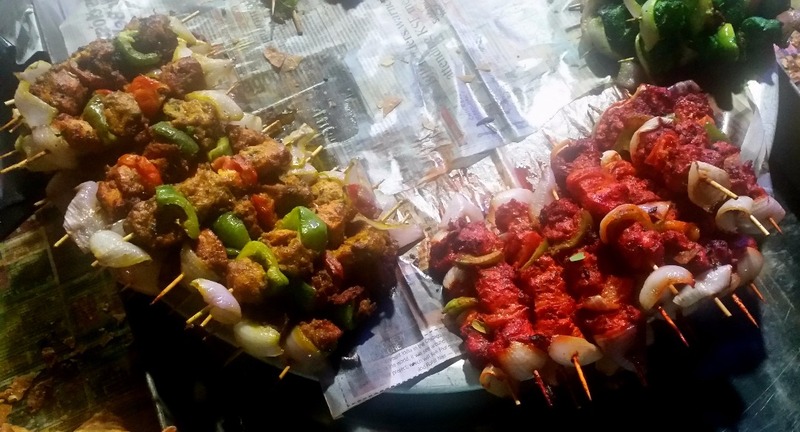 Apart from these kababs, the place was also selling some hot jalebis and juices. While there were many stalls on both sides of the road, we randomly went to Taste Grills and Rolls. 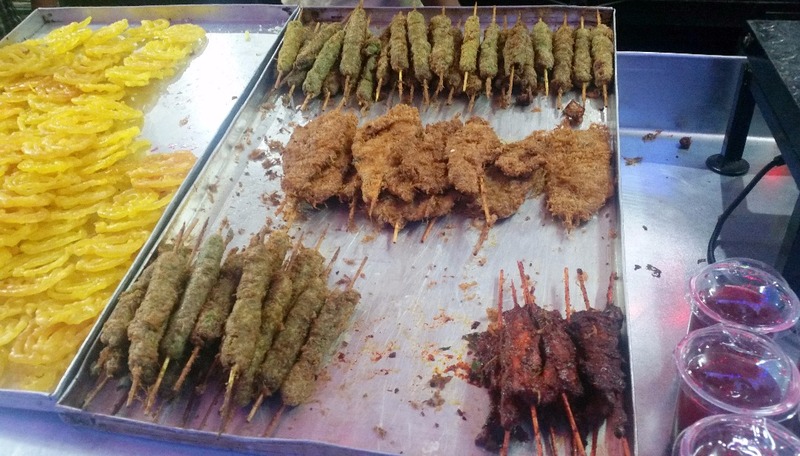 They were offering a set of colourful chicken kababs, again in three types of marinades. 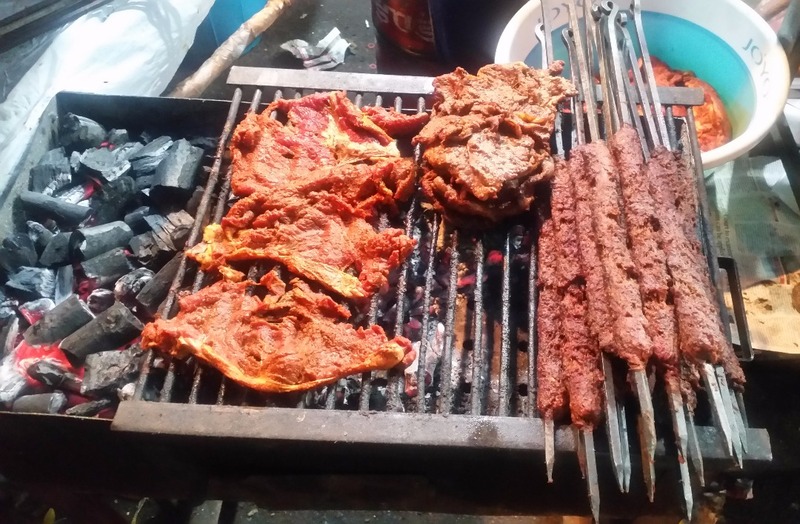 But we were more interested in the Phal, flat pieces of marinated beef grilled over charcoal. 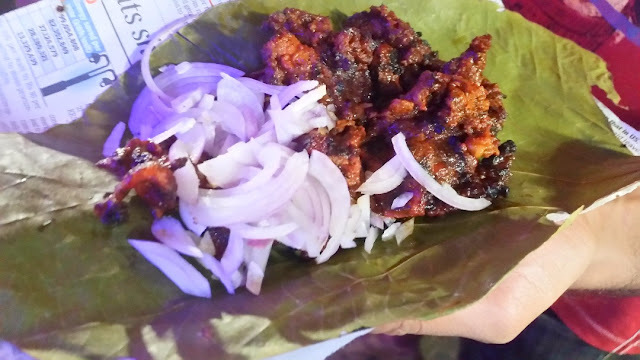 Phal is a favourite dish of Bangalore (Siddique near Johnson Market is known for its phal) and some areas of Karnataka. The phal at Taste Grills did not disappoint us as it had absorbed the marinade well and was soft. We also tried some beef seekh kababs which did not disappoint either. We were careful not to gorge too much in any stall so that we can try out many varieties of food. Our third stop here was Ghousia Hotel. They were making Veal Kababs, the soft boneless beef delicacies on a huge tawa. 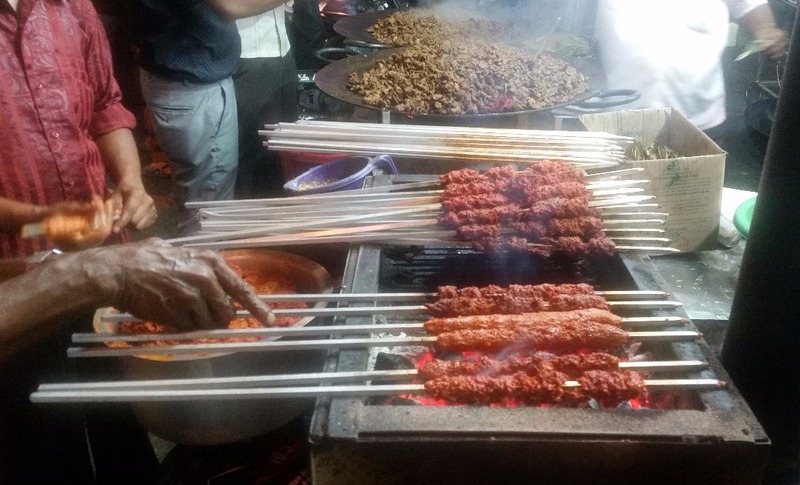 Long skewers alongside were being used to prepare seekh kababs in bulk. Here apart from the usual veal, we also tried a Veal masala dish, which was being savoured by others with rumali rotis. We tried the dish as it is, and the gravy in it was quite tasty. As we progressed further on the road, the density of food stalls increased abruptly. The Tilaknagar Mosque was to our left, and just around the crossing, there were close to twenty stalls on both sides. The aromas of different preparations make it difficult for you to resist trying each and every dish, so we picked stalls with the maximum crowd. The last stall we tried here was Shaikh’s Eatery. The large stall had about fifteen workers preparing food right in front of your eyes. One of the attractions here was the Quail Fry. 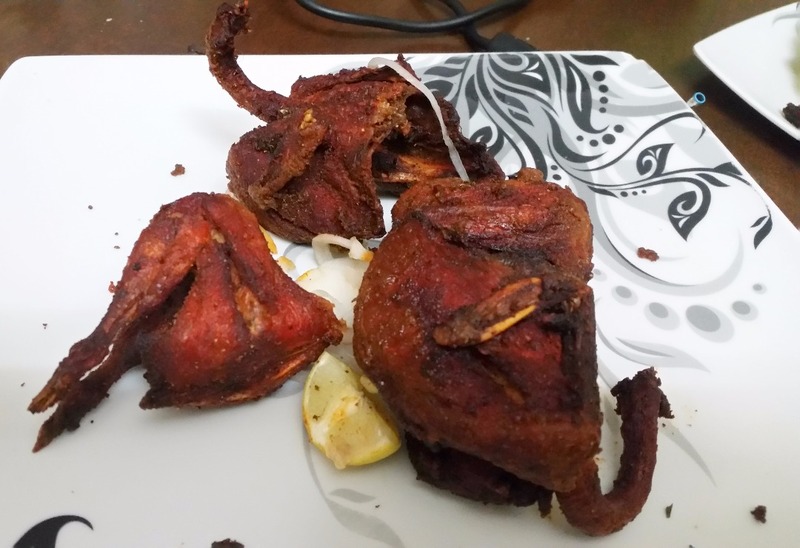 Birds marinated in a red coloured masala was crispy fried in oil. The taste of this dish was definitely better the ones we have in Hyderabad. 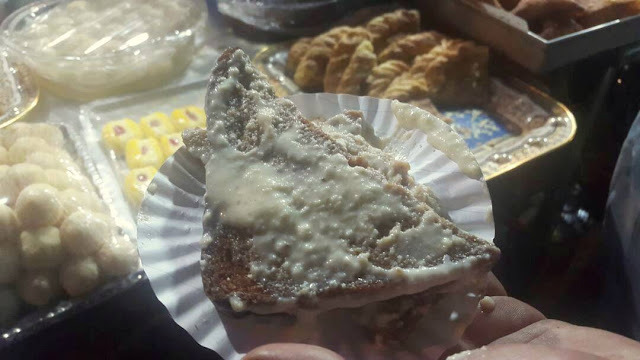 Some of us also tried some desserts available here like a different version of Double Ka Meetha with malai topped slices soaked in sugar syrup. 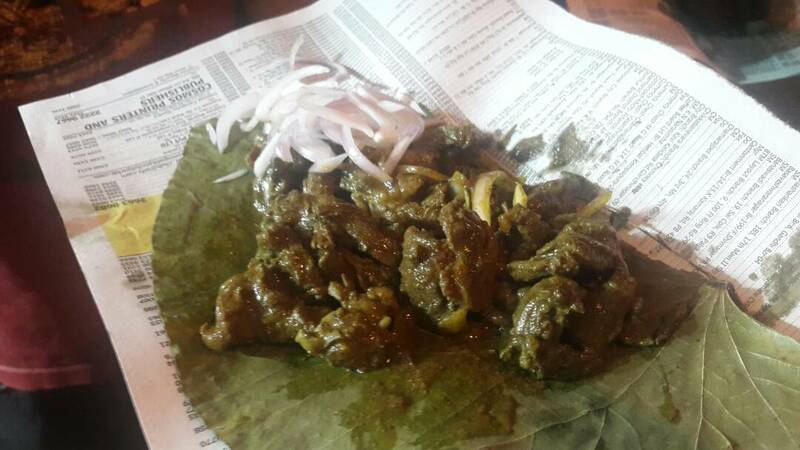 Patthar ka Beef was being prepared on a large heated stone, and we packed some for our homes. Another different dish was the seekh kabab prepared in a green marinade. With the government not encouraging Iftar stalls near Mosque Road, Tilaknagar is definitely turning out to be the new destination for food lovers during Ramzan in Bangalore. The place gets crowded as the night progresses, so make sure you land up here around the time the evening prayers get over.